From time to time, more often than you would think, we’ve seen this weird looking car-like thing driving around the streets of Basel. 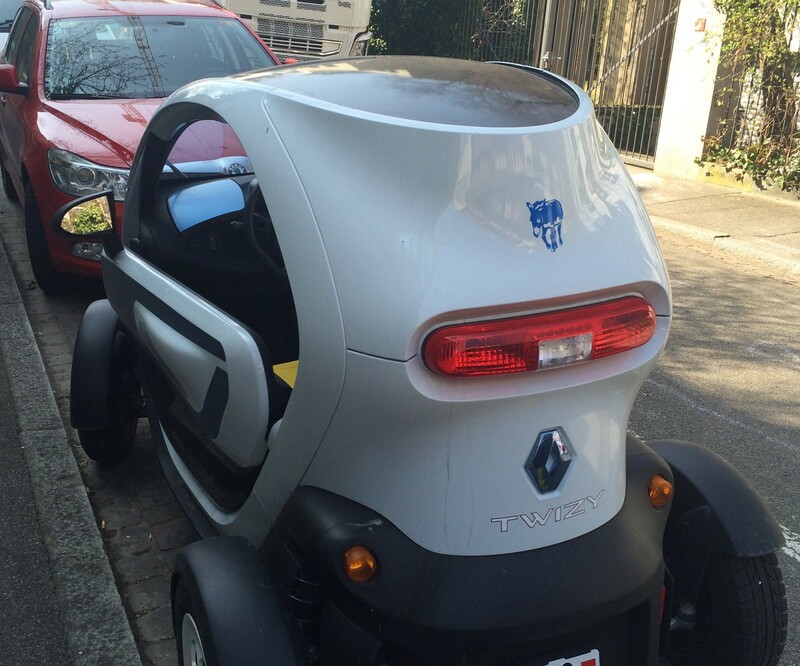 It is made by Renault and it’s called Twizy, which sound like a good name for a cat. It’s a totally electric car and was the best selling plug-in car in Europe in 2012. Twizy is reasonably priced at about €7,000 and can seat 2 people – one in front and one behind. It has a top speed of 28 mph and can go 61 miles before it needs to be recharged. It’s tiny! It’s only about 7 1/2 feet long, almost 4 feet wide, and just 4-feet 9-inches high. My 9yo is taller than this car. Doors are, apparently, optional (although this model has them installed). If you do choose to have them installed they open by pivoting up at the hinge like a Lamborghini. They seem to be coming out with a new model called the Twizy Cargo that can actually haul things, but seats only 1 person. It seems perfect for extremely urban areas like NYC or San Francisco where parking is a premium and you don’t really need to go that far. Although, I don’t see Anna Wintour arriving at the Vogue offices in one anytime soon. But if she does I will applaud her. The Swiss Family Carlson goes to Dijon!! The Swiss Family Carlson Risks Their Lives!! I don’t think 28 mph would make it in San Fransisco or any other city that I’ve been in. They better revamp that part of it!!! Cute though! You’re probably right! Only for the side streets and definitely not for the highways!